We can service your existing onboard air conditioning system or design and install a new one. As dealers for Cruisair and Webasto, we have a broad spectrum of marine air conditioning systems to suit every need. We sell and service the complete line of Dometic CruisAir Products including self-contained marine HVAC units. Self-contained units are typically the best choice for smaller boats up to about 12 meters (40 feet) due to the lower cost of the units and installation.Split Gas Air Conditioning Systems - For Boats Up to 24 Meters (80 Feet): Split air conditioning systems have the condensing unit and air handler installed in different locations. 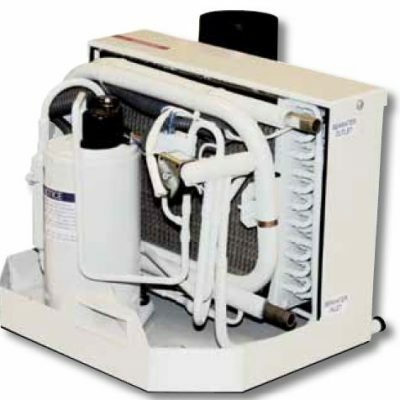 The condensing unit is mounted in the engine room or other mechanical space. The air handler (also called the evaporator) is installed in the living area. 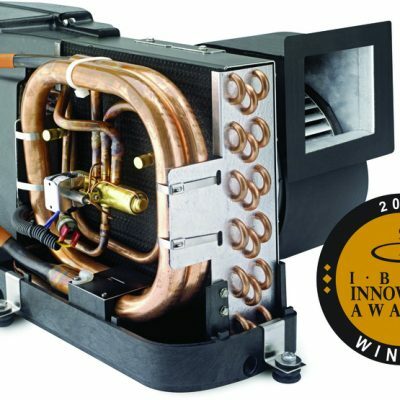 Two air handlers can connect to one condensing unit.Termpered Water Air Conditioning Marine HVAC - For Large Boats and SuperYachts: Cruisair tempered water air conditioning systems (also called chilled water) consist of a chiller, located in the engine room, that cools (or heats) fresh water, then pumps it through an insulated piping loop to air handlers located in the living spaces, where the air is cooled (or heated).If you do not see what you are looking for here please give us a call at 401-683-4434! A compact air conditioning system that provides extreme comfort with whisper quiet operation. Balanced system for vibration and noise elimination. Compact design that allows for zero-clearance installations. Unibody weld provides superior strength. High output in a single compact unit.Webasto Blue Cool Classic Air Conditioning. The installation of a BlueCool Classic system is very simple: Each cabin has its own independent unit supplying that cabin with cool air. Air cooling and distribution with a single device. Simple, space-saving interior installation (e.g. in a cabinet or under a bench). Especially well suited for subsequent installation. The perfect supplement to the Webasto air heating system.Webasto BlueCool Premium Air Conditioning. A BlueCool Premium system is the best choice for larger boats with numerous cabins. The air conditioner is usually installed in the engine compartment, and supplies all cabins with refrigerated water / glycol via the coolant circuit. Low-noise central cooling unit in the engine compartment. Minimum space requirement in the cabinsIndividual temperature control and cold air distribution to all cabins. Option for a comprehensive comfort system through integration with the Webasto water heater.If you do not see what you are looking for here please give us a call at 401-683-4434!